The Florida Keys has one of the largest living coral reefs in the world! Within all the beauty that the reef attains, one thing for sure is that it is loaded with fish! 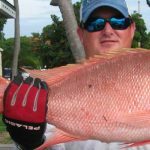 While fishing with Catchalottafish Charters we will target fish such as Yellowtail Snapper, Grey (Mangrove) Snapper, Mutton Snapper, Mackerel, Sailfish, and huge Grouper. Actually, you can catch nearly every type of Pelagic game fish in this same area! This is what makes Reef fishing so exciting! You can actually catch so many different types of fish in one day, and be able to see them actually swimming right up next to the boat. It is an extremely visual experience, while at the same time exhausting from having to reel in all the fish you can handle. Although, with all the excitement you will never realize how exhausting it can be, because you won’t have time to even think about being tired! There are several techniques used while fishing on the reef. One technique is chumming with ground up fish, oats, and sand. While deploying the chum, we also will use a mixture of live baits to get the fish real excited. Once the chum is in the water, look out! It is an absolutely amazing sight to see the ocean come alive! It is definitely something you won’t ever forget! 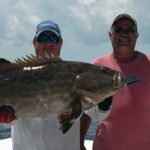 So hold on, and let Catchalottafish Charters take you on the adventure of a lifetime!